The Fixing America’s Surface Transportation Act (FAST Act) became U.S. law on December 7, 2015. It deals with more than the repairs and upkeep of the nation’s roads, bridges and other surface transportation. Taxpayers beware; the FAST Act is not just about transportation; so don’t let the title fool you! Section 32102 authorizes the U.S. Treasury or Internal Revenue Service to enter into one or more qualified tax collection contracts for the collection of all outstanding inactive tax receivables. That mean private debt collectors could be hired to help the government collect unpaid taxes. 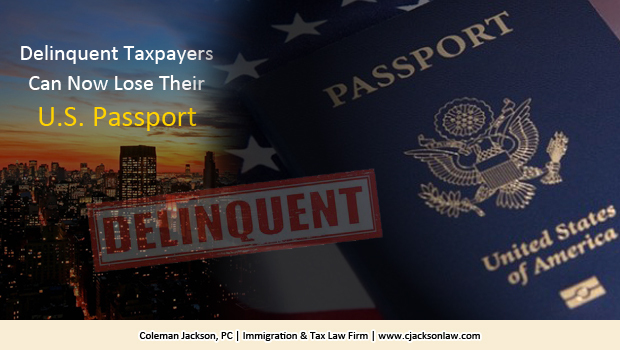 Without a valid U.S. Passport, international travel would be pretty much impossible for a delinquent taxpayer. Unwelcomed calls from debt collectors attempting to collect unpaid taxes would not be an ideal tax holiday. Taxpayer’s affected by these FAST Act tax provisions may be prohibited from traveling for pleasure, health reasons, emergency, family matters, business matters or any other reason; if such travel requires a U.S. passport. If the intent of the FAST Act tax provisions is for taxpayers to prioritize getting their back taxes paid or making appropriate payment arrangements with the IRS for payment of unpaid taxes; the Tax Provisions in the Fixing America’s Surface Transportation Act is sure to get delinquent taxpayer’s attention. 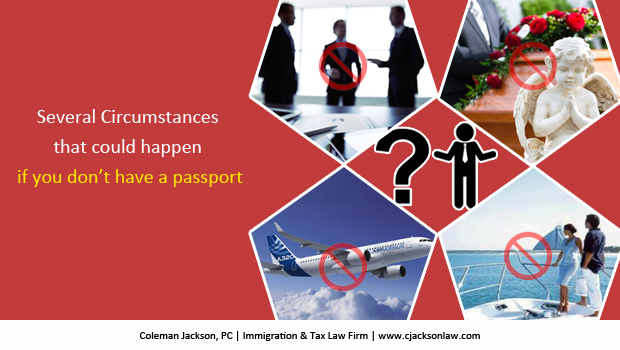 This tax law blog is written by the Tax & Immigration Law Firm of Coleman Jackson, P.C. for educational purposes; it does not create an attorney-client relationship between this law firm and its reader. You should consult with legal counsel in your area with respect to any specific immigration, IRS tax problems and other income tax, gift tax, or estate tax issues or your particular set of circumstances impacting you, your family or business. This entry was posted in Taxation and tagged dallas, Dallas immigration lawyers, Dallas-Fort, debt collector, deliquent taxes, FAST Act, Immigration, income tax problems, IRS problems, passport, tax advisor, tax attorney, unpaid taxes on December 21, 2015 by Coleman Jackson. Innocent spouse establishes by facts and circumstances that it’s inequitable include its share of this community income in the innocent spouse’s gross income. Many folks, especially immigrants fresh to America, can be quite surprised by the complicated, intricate, intertwining system of laws that could impose federal and state taxes upon them for property owned by their spouses prior to marriage- indeed owned prior to their coming to the United States. Taxation of income earned on separate property can dissipate an inheritance. A Last Will & Testament will not fix these taxing anomalies unless the testator by unequivocal language directs that a tax be paid out of its estate rather than by its beneficiaries. Without precise language in the Will, the courts will not assume by implication that the testator intended to make a gift. See Stewart v. Selder, 473 S.W.2d 3 (Tex. 1971). Courts will not rewrite a bad Last Will & Testament; nor will the Courts write a Last Will & Testament for someone who dies intestate. 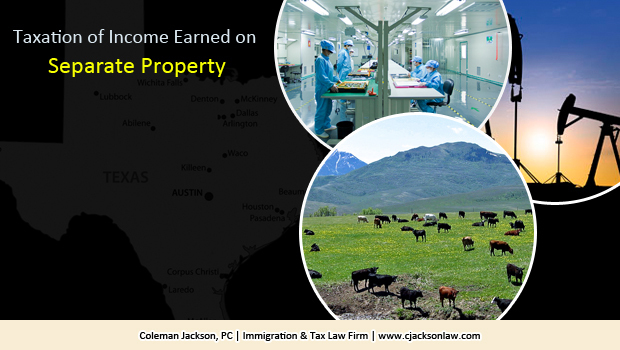 In Texas, increments of wealth earned on separate property are community property. Who pays the tax depends upon whether the couple engages in proper estate planning. What do you have, and who do you want to give it to? Immigrants who come to the United States unconcerned with the tax consequences imposed by the federal and state governments on increments of wealth generated on separate property owned prior to their marriage and immigration into the United States could unnecessarily dissipate their inherited estate. 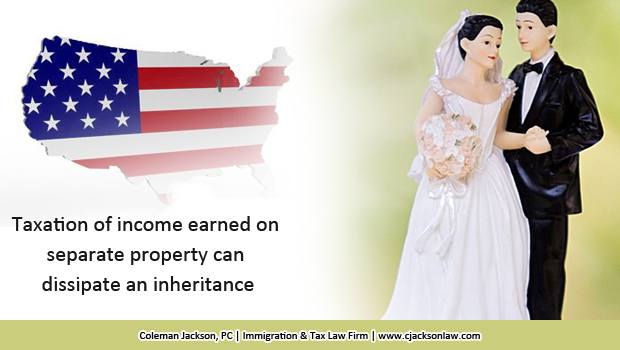 This gift and estate tax law blog is written by the Tax & Immigration Law Firm of Coleman Jackson, P.C. for educational purposes; it does not create an attorney-client relationship between this law firm and its reader. You should consult with legal counsel in your area with respect to any specific immigration, estate and tax issues or your particular set of circumstances impacting you, your family or business succession. This entry was posted in Family Immigration, Taxation on December 12, 2015 by Coleman Jackson.